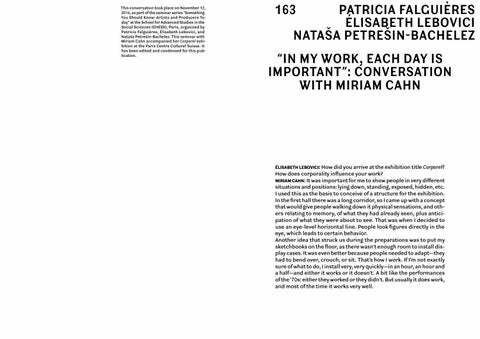 This conversation took place on November 12, 2014, as part of the seminar series “Something You Should Know: Artists and Producers Today” at the School for Advanced Studies in the Social Sciences (EHESS), Paris, organized by Patricia Falguières, Élisabeth Lebovici, and Nataša Petrešin-Bachelez. This seminar with Miriam Cahn accompanied her Corporel exhibition at the Paris Centre Culturel Suisse. It has been edited and condensed for this publication. ÉLISABETH LEBOVICI: How did you arrive at the exhibition title Corporel? How does corporality influence your work? situations and positions: lying down, standing, exposed, hidden, etc. I used this as the basis to conceive of a structure for the exhibition. In the first hall there was a long corridor, so I came up with a concept that would give people walking down it physical sensations, and others relating to memory, of what they had already seen, plus anticipation of what they were about to see. That was when I decided to use an eye-level horizontal line. People look figures directly in the eye, which leads to certain behavior. Another idea that struck us during the preparations was to put my sketchbooks on the floor, as there wasn’t enough room to install display cases. It was even better because people needed to adapt—they had to bend over, crouch, or sit. That’s how I work. If I’m not exactly sure of what to do, I install very, very quickly—in an hour, an hour and a half—and either it works or it doesn’t. A bit like the performances of the ’70s: either they worked or they didn’t. But usually it does work, and most of the time it works very well. style was entirely feminist. Perhaps she is important to a lot of Swiss female artists, but not to me. She was also from another generation. EL	So, for you, it was feminism as seen through performance? MC	Yes, because it was interesting to observe someone like Ulrike Rosenbach, for example—who used to be very feminist, but too ideological for me. We would speak of things in terms of contemporary art since, for example, the slogan “das private ist das politische, das persönliche das öffentliche” [“the private is political, the personal is public”] is equally valid for both feminism and art. EL In the exhibition at the Swiss Cultural Centre there is an entire section of your lesser-known work, photos of your in situ interventions. Could you tell us about these rather special works? 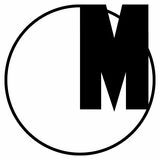 MC	It started during a scholarship at the Cité des Arts in Paris in 1979. Since I had a small studio, I used to go outside to do large drawings. And that was interesting because, being a woman, everyone told me it was very dangerous to do such things alone, at night… EL	Yes, indeed! You went under motorway ramps, pretty rough areas… MC	And the infamous tunnel! That was fascinating to me because it had columns and it was like a book. Once again, I worked very quickly: less than two hours, late at night. I went straight back in the morning to take photos, and by the afternoon it had all been erased (EINGESCHLOSSEN IN MICH SELBER [closed in on myself]) A (1979). The following year, I did another large work when I returned to Basel. It was during a large motorway construction project. For me, it was a political gesture, as I wished to protest against this motorway that was going to destroy a whole district. But the first night I went over there, in five minutes I fell in love with the place. Not as a motorway, naturally, but as a space for my work. I really liked the concrete, the functionality, and the fact that it was so beautifully immense. EL	Effectively, you replaced slogans, posters, demonstrations, and marches with in situ drawings. MC	Yes, they were just the starting point. What followed was something else entirely. That’s what interested me. EL	And did it become a motorway in the end? feeling. Personally, I don’t think an ideological critique becomes more justified by taking direct action. NPB	Do such things later fuel your work in the studio? The concentration and this physical, corporal work? Do you remember images and ideas? MC	Yes, naturally. I remember what I can. My memory is temporary. Memories of images must be managed like a garden. You never know what will come of it! The older I get, the more I have some sort of archaeology of images in layers, but it’s all rather unclear. NPB	What form does this archaeology of images take? Is it always mental images, or do you cut pictures out and archive them for later use? MC	No, I don’t really keep archives. I either have them in my head or I don’t. But, naturally, I see huge numbers of images when reading the newspapers, watching TV, and so forth. But I’m not systematic and I soon get bored. They’re all in my head. EL	Your works contain horror and violence, but also joy, all on the same level. MC	And it has to be on the same intellectual level, too. Returning to Eichmann and that central work at the Swiss Cultural Centre, we might be tempted to think we’re good people, and the Nazis were the baddies. But it’s not that simple, and today we see it isn’t the case, anyway. Regarding content, that’s interesting because, since I work every day, it’s a kind of procedure—pretending to treat everything the same, on the same level. Of course it’s impossible, but I feel it’s a great viewpoint to work from. Not differentiating whether a work is pretty or ugly, good or bad. Of course they’re different, but I find it interesting to work while pretending that everything is equal. EL	Is that related to your working conditions? The fact that you’re all alone in your studio in a rather remote Swiss valley? Is your concentration linked to your isolation? MC	I never know what people imply when they say “remote.” What does it mean? EL	A valley in the mountains… You can tell I am from Paris! MC	It can be very remote in Paris, too.